Craif Elevitch announces that the new pandanus profile is now posted on the project web site at http://www.traditionaltree.org. Illegal logging and corruption in Papua New Guinea are destroying the largest remaining tract of primary tropical forest in the Asia-Pacific region, an environmental watchdog warned. Malaysian interests dominated the multi-million dollar logging industry while much of the timber was processed in China for consumption in Europe and North America, Washington-based Forest Trends reported Tuesday. Working conditions were described as "modern-day slavery," while forests were effectively being "logged out," the international non-profit organisation said in its report "Logging, Legality and Livelihoods in Papua New Guinea". The report summarises findings from five independent reviews of the timber harvesting industry conducted since 2000 for the PNG government and the World Bank. The government of the half-island state off the northern tip of Australia received 30 million dollars in cash revenues from logging annually and official inspections at export only ensured export taxes were paid, the report said. "Thus, official export documentation merely launders the unlawful timber into legitimately-produced exports accepted by governments and retailers worldwide," it said. PNG's forest industry is mainly focused on harvesting natural forest areas for round log exports, with little plantation production and a limited number of processing facilities. "The sector is dominated by Malaysian-owned interests and the primary markets for raw logs are in China, Japan and Korea," the report said. "Many of the logs are processed in China for consumption in Europe and North America." Corruption was an underlying theme in the independent reviews, it said. "Corruption has a devastating effect on the living standards in the area as well as the long-term benefits for landowners," said Kerstin Canby, Forest Trend's program manager for finance and trade. The government needed to support operations which were beneficial to both local landowners and the country or "risks having the international community boycott all of PNG's exports," he said. The report was released on the day environmental group Greenpeace launched an initiative to establish a "global forest rescue station" in a remote part of PNG to support tribal rights against the logging industry. Greenpeace volunteers from around the world would live and work alongside local landowners and eco-forestry trainers at the station at Lake Murray in Western Province, the group said in a statement. They would help three Lake Murray tribes establish their rights over approximately 300,000 hectares (740,000 acres) of tribal territories by identifying, marking out and mapping their boundaries. "We want to say no to loggers who come in and destroy everything," Kuni clan leader Sep Galeva was quoted as saying. "We want to do small scale logging by the landowners in a way that is sustainable and environment friendly." Less than one percent of forests in Papua New Guinea had any form of protection and more than a quarter of a million hectares of primary forest were lost each year, Greenpeace said. A new CD-ROM intended as a teaching material resource has just been produced by Teaching-aids At Low Cost, a United Kingdom-based group, with financial support by UNICEF. It is exciting that among the many materials presented from around the world there are also some from the Pacific, including those from the Secretariat of the Pacific Community Lifestyle Health Section and the Island Food Community of Pohnpei. These include SPC’s new health/nutrition Fact Sheets, the Pohnpei Bananas poster and booklet, and the Kiribati pandanus poster. Each item (mostly produced between the year 2000 and 2005) is presented with a short explanation about its use. All contributors are listed with their contact details. 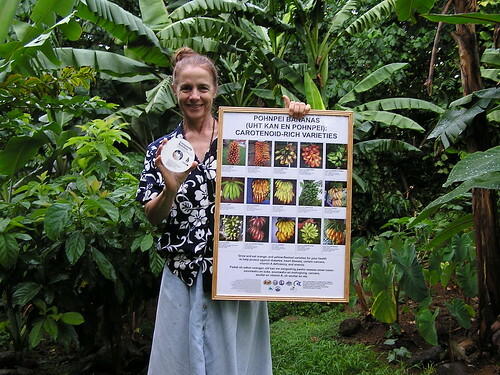 Ann Burgess, a nutrition consultant, who worked intensively on this project, commented that the colorful photographs of Micronesian bananas and pandanus added a lot of color to the CD. At this time 5000 copies are being produced. For distribution, the priority is to get copies to target users (health practitioners and development workers in developing countries and their trainers who have limited access to nutrition materials). A few copies are now being provided to SPC and the Island Food Community of Pohnpei. To request a copy of the CD, please contact TALC at info@talcuk.org. You need to send your name, affiliation/organisation, full postal and email address, and the reason why you want the CD. As funds are limited, TALC may ask you to pay a delivery charge, especially if you want multiple copies. More details of the CD will be posted on the TALC website http://www.talcuk.org/, which also gives information on other TALC nutrition-related education materials. The picture shows Lois with the CD and one of the resources it contains, the Pohnpei bananas poster. Lucid is a software developed by the Centre for Biological Information Technology for making interactive identification keys. It can be used to distinguish species, disease symptoms or, as in this website maintained by the Bishop Museum, varieties of a crop, taro in Hawaii in this case. PACINET, the Pacific Taxonomy Network, has just finished running a workshop on Lucid which included a couple of PGR people, from Fiji and PNG. Maybe we can have similar keys for Pacific Island Countries in the future. I think I missed this report on an important FAO meeting when it first came out in November. Threatened by the turbulence of globalization and the uncertainties of climate change, Small Island Developing States (SIDS) have been for decades struggling against the odds to develop their economies and improve the diets, health and livelihoods of their people. FAO convened a Special Ministerial Conference in Rome 18 November 2005 in support of the 38 countries that make up the Small Island Developing States and Low-Lying Coastal Countries, some of the world’s most vulnerable nations. The Conference was called to explore how agriculture, forestry and fisheries can be better integrated into SIDS economies to improve the nutrition and food security needs of islanders and to provide better employment opportunities. The threat to SIDS from environmental changes, hurricanes, cyclones and typhoons is widely known, especially following the December 2004 tsunami, which struck several SIDS countries. However, these small islands also face many other lesser known, but no less serious challenges to the health and livelihood of their people and economies. In a background document prepared for the Conference, FAO lists eight specific vulnerabilities that SIDS countries share. For example, they are all vulnerable to their environmental situations because of their narrow natural resource bases. Their remoteness and propensity for climatic disasters limit the options SIDS have to address their natural and man-made hazards and their ability to diversify their economic activities. SIDS small national economies make them more reliant on trade and, thus, especially susceptible to external shocks. According to the background document, SIDS have very diverse economies and levels of development, with some depending on agriculture, forestry and fisheries and others relying primarily on sectors such as tourism for their food security. Instability in agricultural production and exports and increasing dependence on food imports by SIDS has led to vulnerabilities caused by events that are often outside their control. As an important means towards achieving the Millennium Development Goals, FAO has been assisting SIDS since the Barbados Programme of Action in 1994 (see related story, “From Earth Summit to Rome Ministerial Conference”), helping to increase food security by improving the efficiency of their food production systems. 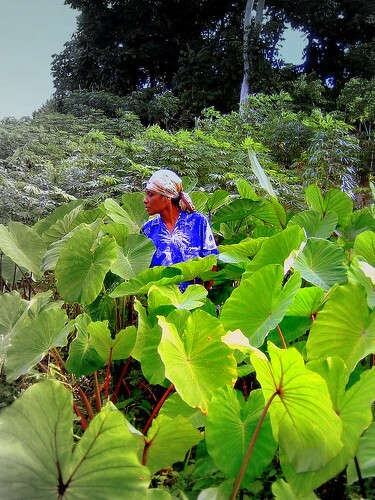 Recently the focus of FAO assistance has shifted to integrating sustainable food security policies and programmes within the national poverty reduction strategies of SIDS in recognition of the important role that agriculture, including forestry and fisheries, plays in an effective strategy for economic growth. Soundly managed agriculture, forestry and fisheries increase the self-reliance of island people and also protect the environment. Improved agricultural diversity and better farming practices not only improve islanders’ food security, but it will reduce the ravages these countries face when struck by natural disasters like hurricanes, cyclones and typhoons. Diversified agricultural production systems, effective fisheries management and planting hurricane-tolerant crops, together with good forestry practices would all combine to improve the lives of islanders. While land resources on small islands are small, the islands often govern limited tracts of ocean. The FAO project, Responsible Fisheries for Small Island Developing Countries, focuses on the implementation of the FAO Code of Conduct for Responsible Fisheries, to help SIDS strengthen the capacity of fisheries administrations in order to promote and facilitate responsible fisheries in support of social and economic development. Ministers of Agriculture of Pacific and Caribbean SIDS and Caribbean Community Heads of Government earlier this year endorsed two concept notes supporting the expansion of FAO’s Regional Programme for Food Security (RPFS) in the Caribbean and Pacific. The expanded programmes will address development constraints in the rural sector through investments in rehabilitation and construction of rural infrastructure such as water management, rural transportation, crop storage and processing. The programmes will also provide policy and technical assistance that addresses limitations in market access to food as well as disaster preparedness, management and mitigation. Scaling up RPFS will engage a broad range of ministries, civil society, private sector organizations and the donor community in activities to build synergies with other initiatives and ensure coherence with existing strategies such as national development frameworks, poverty reduction strategies and ongoing activities aimed at achieving the Millennium Development Goal targets. Progress made in the preparation of National Medium-Term Investment Programmes, the formulation of a portfolio of Bankable Investment Project Profiles and the implementation process for scaling up the RPFS will be presented to SIDS during the Special Ministerial Conference. Faced with threats on a number of fronts, SIDS are racing against time when it comes to economic and social development. To achieve economic resilience they will need to develop agro-enterprise and value-added commodity chains as well as exploit organic and fair-trade agriculture, linking agriculture with tourism. Social resilience issues that call out for attention are land tenure security, traditional food systems and sustainable livelihoods as well as nutritional security. And finally, environmental resilience demands the development of responsible fisheries, sustainable forest management and adaptation to climate change through disaster risk management. Food security and the environment could be improved in many SIDS by reinvigorating some traditional indigenous food systems, which have proved to be effective in mitigating disasters caused by the more risky farming methods of the late 20th century. Small-scale traditional systems, including artisanal fisheries and non-grain starchy staples continue to hold the promise of better diets and less environmental damage. The erosion of traditional cropping systems and secure land rights have contributed to increasing poverty, malnutrition and unsustainable urbanization.According to FAO, the contribution of small-scale enterprises to national development and poverty reduction needs to be increased by allocating more resources in their support. Applying FAO guidelines for increasing the contribution of small-scale fisheries to poverty alleviation and food security could help build fishing capacity, while upgrading local skills and traditional knowledge with modern scientific guidance can offer cost-effective solutions for renewing traditional food systems.If SIDS can meet these challenges, with assistance from the international community, their people can look forward to a healthier life with more economic opportunities and less disruption from natural disasters. The international community has much to gain from helping to preserve these island states and the ecosystems that support them. Lois eating Italian traditional food? I am happy to share with you that I am back from the global Nutrition Stakeholders Meeting on Biodiversity and Food and Nutrition, held in Rome, Italy, at the headquarters of the International Plant Genetic Resources Institute (IPGRI). It was an inspiring and productive meeting and gave me new ideas on how we can promote our own local island foods. Then another person said: “I read the Micronesian paper (submitted for the meeting) and I am so interested in the taro!” She explained that in her country they also have a type of taro, but that the varieties have not yet been assessed for their nutrient content. She was very interested that there are Micronesian giant swamp taro varieties rich in carotenoids and minerals (including iron and zinc). Another person had heard of the Mand project (in collaboration with CINE) and was interested in hearing more about it. I explained what Kiped Albert of Mand had told me right before I left for Rome…that they had had a traditional leaders meeting and that people are now starting to plant more foods. He said that the new GO LOCAL billboard in Mand played a role in that. One farmer said that it had given him the inspiration to plant as his land is so close to the sign. In my next email I will give some more news about the meeting and its outcomes. Also I would like to here thank the meeting organizers and IPGRI, especially Emile Frison for his invitation and Annie Huie for all her organizational work, and a special thanks to Luigi Guarino of SPC for his support in my attending this meeting. So let’s remember all the wonderful diversity of local island food (and varieties) and do what we can to support it for its many reasons…health, food security, economics/livelihoods, cultural preservation, and the environment! Contact information for registration and questions: Craig Elevitch, Project Coordinator, Permanent Agriculture Resources, PO Box 428 Holualoa, HI 96725, USA. Tel: 808-324-4427; Fax: 808-324-4129; Cell: 808-990-4859; E-mail: cre@agroforestry.net. Main web site: http://www.agroforestry.net. Traditional Tree Initiative: http://www.traditionaltree.org. 2006 workshops: http://www.agroforestry.net/events/afwksp2006.html. Bourke, R.M. An overview of edible fruit and nuts in Papua New Guinea. Paper presented at Papua New Guinea Fruit and Nut Workshop, University of Vudal, October 2005. Bourke, R.M. Indigenous edible nuts in Papua New Guinea. Paper presented at Papua New Guinea Fruit and Nut Workshop, University of Vudal, October 2005. Bourke, R.M. Introduced fruit in Papua New Guinea. Paper presented at Papua New Guinea Fruit and Nut Workshop, University of Vudal, October 2005. Bourke, R.M. Potential for further commercial development of introduced fruit. Paper presented at Papua New Guinea Fruit and Nut Workshop, University of Vudal, October 2005. Bourke, R.M. Production patterns for fruit and nut species in Papua New Guinea and some implications for marketing. Paper presented at Papua New Guinea Fruit and Nut Workshop, University of Vudal, October 2005. USDA-NRCS Hawaii is offering up to $350,000 in the Conservation Innovation Grants for the Pacific Islands Area (Hawaii, Guam, American Samoa, and Northern Marianas Islands). The Resource Centres for Urban Agriculture and Food Security puts out Urban Agriculture Magazine. No. 13, which came out in 2004, was about Urban and Periurban Forestry and had an article on Urban Gardening on the Small Islands of the Pacific by Prof. Randy Thaman of USP. The pdf is not that big but I can send it to anyone who has trouble downloading it. Despite the considerable importance of urban gardening in the Pacific Islands, there are a number of problems faced by urban gardeners. Unfavourable climate, poor soils, cost and availability of land and water, insufficient time and labour, theft, and lack of government assistance were most commonly mentioned by those surveyed. The problems relating to drought include the high cost of water, distance to community faucets, water cancellations and fear of City Council regulations against the use of water for gardening purposes. The atolls are also periodically affected by prolonged droughts, which commonly lead to the death of a significant proportion of breadfruit and citrus trees and other trees and food plants that are only marginally suited to the atoll environment. Urban gardeners commonly have to contend with infertile poor soils. Continual cropping on small urban plots also leads to declining fertility and loss of soil structure, unless ameliorative measures are taken. Both water shortage and poor soils, however, often make trees a more attractive proposition than short-term ground crops which require water and higher soil fertility. Insufficient land and insecurity of tenure are problems in most areas. Insecurity of tenure seems to be a major problem and a strong disincentive to urban gardening. City Council regulations, although not strictly upheld, were also considered to be a disincentive and they discourage cultivation of ground crops and trees along road frontages. Other problems include diseases, insects, birds, rats, dogs, mongooses and noxious weeds; theft of produce, especially of banana bunches and tree fruit. The importance of urban gardening and its implications for planning are not clearly understood by most planners and policy makers in the Pacific Islands because of a lack of quantitative data on its nature, extent, and cultural and ecological significance. However, increasing interest has recently been shown by some city planners and administrators, like in Vanuatu, Tonga, Kiribati, Tuvalu, the Federated States of Micronesia, and the Marshall Islands, where urban food dependency and increasing incidences of nutritional disorders have become serious problems. Pacific kava producers are ecstatic, after the findings of new scientific research suggested kava may prevent some types of cancer, including leukemia and ovarian cancer. Researchers at the University of Aberdeen in Scotland and the Laboratoire de Biologie Moleculaire du Cancer, a medical school in Luxembourg, have found that some chemicals in kava could help control cancer. It's welcome news for the Pacific's kava industry, which is still struggling with the stigma associated with a European Union ban on the product three years ago, amid concerns it could cause liver damage. From Agricultural Information News from IAALD. Six agricultural research and development institutes in Papua New Guinea are working together in a national agricultural information system (PNG-NAIS). They aim to maintain and exchange library and information resources to benefit both the individual institutions and the country as a whole. The core of the system is a shared library catalogue with information from 18 participating libraries. The web site, with some sections under development, also provides information about publications and reports produced in the country. JOURNALISTS need to be better informed about environmental issues to enable them to produce better reports. University of the South Pacific journalism program coordinator Shailendra Singh said the seminar was organised to enlighten journalists on major environmental issues affecting Fiji and the fragile ecosystems of the region. "Providing in-depth and analytical environmental coverage is a challenge for journalist's and the aim of the seminar is to enrich the media's understanding of this crucial issue," said Mr Singh. He said at the same time, people should keep in mind that journalists were in a position to inform, educate the public and encourage opinion and advocacy. Topics from climate change, conservation biology, over fishing, turtle conservation, marine protected areas, evolving environmental issues, biodiversity, depletion and protection of resources and plastics as a major environmental hazard, were discussed. He said participants of the seminar should be able to look at ways to improve the level of environmental reporting in Fiji and the region. Speakers at the seminar were scientists, researchers, environmentalists and experts from Greenpeace, the World Wildlife Fund, the Foundation of the People of the South Pacific and Seaweb, a non-profit organisation that is communications based which promotes ocean conservation. Mr Singh said speakers came from the USP Faculty of Islands and Oceans, Institute of Applied Sciences, School of Biological Sciences and School of Chemical Sciences. Participants at the seminar were professional and student journalists. The University of the South Pacific journalism programme and the Fiji Media Council will co-host a daylong seminar on the environment for journalists tomorrow (Wed, Feb 15). The seminar at the Laucala Campus in Suva will feature scientists, researchers, environmentalists and experts from four regional and international environmental groups Greenpeace, the World Wildlife Fund, the Foundation of the People of the South Pacific and SeaWeb, a communications-based non-profit organisation that advances ocean conservation. Speakers from the University of the South Pacific¹s Oceans and Islands faculty, Institute of Applied Science, biology department and chemistry department will also address professional and student journalists during the seminar. The USP¹s journalism programme coordinator, Shailendra Singh, said the seminar had been organised to give journalists an insight into the major environmental issues affecting Fiji and the fragile ecosystems of the region. Topics covered will include conservation biology, climatic change, over fishing, marine protected areas and turtle conservation, evolving environmental issues in Fiji, biodiversity, the depletion and protection of resources and plastics as a major environmental hazard. Among the speakers is Samir Patel, a freelance environmental science journalist and photographer from New York. Patel, whose work has appeared in The New York Times, Christian Science Monitor, Columbia Science Review, City Limits Weekly, Physicians Practice and New York Daily News, is supported on this trip to the South Pacific by a Pulitzer Traveling Fellowship awarded by the Columbia University Graduate School of Journalism. His topic is "Environmental Journalism: Islands of Understanding". A representative from Fiji's Environment Department will speak on Fiji's recently passed Environment Management Act. Singh said that at the end of the exercise the group would look at what it could collectively do to improve the field of environmental reporting. Agro-morphological characterization and inter-simple sequence repeat (ISSR) DNA fingerprinting were used to evaluate variability among selected Papua New Guinean (PNG) taro (Colocasia esculenta) accessions. Twenty-three discriminatory descriptors selected from the International Plant Genetic Resources Institute (IPGRI, 1999) descriptor list were combined with ISSR markers to characterize 13 taro accessions. Genotyping data were obtained via polymerase chain reaction (PCR) with three ISSR primers: (GA)9AT, (GA)9AC and (ACC)6Y. Initial evaluation of the agro-morphological variation indicated that the total variation observed appeared to be associated with colours of corm flesh, corm cortex and petiole, stolon formation, corm shape, lamina orientation and lamina vein pattern. All genotypes were separated as distinct morphotypes, providing useful information for development of a minimum descriptor list. ISSR primers generated complex banding patterns, with primer (GA)9AC amplifying fewer but proportionately more (90%) polymorphic fragments. Fingerprinting with three ISSR primers enabled the identification of closely related genotypes and the separation of those that were distantly related. Little correlation was found in between the agro-morphological and molecular data in the clusters generated. However, the two types of data provided complementary information on the existing diversity and available genotypes that can be immediately used by the breeders. "If the root is Hawaiian, it is part of Hawaiians," said Walter Ritte, Jr., speaking to a group of organic farming activists, hoping to make Hawaiian taro that was genetically modified by the University of Hawaii available to all Hawaiians. Ritte argued that the taro was modified without permission of Hawaiians, to whom it is like family. To him and other Hawaiians, this is wrong from a moral and philosophical level. The group, Hui Ho'okapele Aina, is setting its aim on a bill that puts a 10-year moratorium against any GE testing in Hawaii, which will be introduced to the legislature this year. Sophora toromiro is an endemic mimosa once native as an abundant shrub on Rapa Nui (Easter Island). Wood collection and grazing decimated this shrub and reduced biodiversity on this island from a 45 square mile tropical paradise into one of the most vivid ecological disasters in the Pacific Island. This site is devoted to caring for the remaining trees in botanical gardens elsewhere, as the island has not supported native specimens since 1962. About 100 plants grown from seed have been reintroduced with the goal of reestablishing this plant on Rapa Nui. By Dionisia Tabureguci in Island Business. The production of agricultural commodities organically is accounting for a bigger and bigger slice of the national income in the more developed countries today. But the same cannot be said for most islands countries in the Pacific where, it is often said, the situation is ideal for organic agricultural production. In 2001, Australia's Rural Industries Research and Development Corporation (RIRDC) estimated the country's organic industry could be worth $1 billion (including exports) by 2006. In that year, the industry (excluding export sales) was worth $220 million. By then too, the organic agricultural production was already diverse, with around 1800 certified producers, processors, distributors and retailers of organic food and fibre products operating in diverse industries, including grains and pulses, horticulture, viticulture, beef and pork, dairy and honey markets. Seafood was a new opportunity to be explored by RIRDC. Today, international researches into global organic production document Australia as a leader in organic agricultural production with over 15 million hectares and over 2000 farms under organic management. Globally too, this industry is estimated to reach US$100 billion in sales as demand is growing annually at a rate of 20 to 30 percent. Those who are advocating the strengthening of this concept in the local scene say it should be easy for the islands to go into organic farming because the way of life is still agrarian- based and the use of chemicals and fertilisers are not very prominent. “We already have an advantage because we don't use chemicals very much,” says Sada Nand Lal, coordinator of entomology at the Secretariat of the Pacific Community's Land Resources Division section. SPC is one of the stakeholders behind the resurrection of organic farming, to begin first in Fiji and, later on, in its member countries in the Pacific. Lal, who heads the SPC's Integrated Pest Management (IPM) project, says SPC would provide technical support to organisations set up to nurture organic farming. That organisation became what is now known as the Fiji Organic Association (FOA). It is still headed by former government agriculturalist-turned businessman Sant Kumar. “SPC has been a very ardent supporter of FOA technically and financially,” says Lal. “There is a lot of potential for organic agricultural production all around. We have fruit trees growing wild here and no one ever sprays them. That is a starting point. “What is missing here is a set of industry standards which we need in order to certify these products so we can sell or export them as organically grown fruits. And of course, getting a standard in place would depend on what market we are targeting. Kumar has been working fervently at getting some form of certification to help farmers who are looking at exploring organic farming. “It is a very expensive exercise if farmers are to be doing it individually,” says Kumar. He cites an example where one of the already established local enterprises is known to have paid up to F$10,000 for certification. FOA was officially set up in 2003 to help stimulate organic agriculture and develop it from a niche industry into a major component of agricultural production in Fiji. In its two-year life, FOA has not been able to achieve much with its temporary office bearers. But it has managed to send a local abroad to study certification at ECOCERT (a certifying organisation specialising in European certification). It is also in the process of getting affiliated to IFOAM (International Federation of Organic Agricultural Movement), the umbrella body of organic agricultural production. Early this year, FOA managed to draw up a constitution and a framework of activities giving way to an annual general meeting to be held at the end of the year to appoint office holders. “We have been trying to get an Internal Control System (ICS) in place which would at least take us closer to certification. “For example, if a noni exporter wants to buy noni fruits, he or she could do so only from farms which have been certified. This effort by FOA has not fallen on deaf ears and there is a possibility that an ICS would eventuate soon. When this edition went to press, the Brussels-based Centre for the Development of Enterprises (CDE), the European Union arm tasked with providing technical assistance to the private sector, announced a training workshop on ICS in organic agriculture, which was to be held in Fiji. “A CDE fact finding mission in July had meetings with key stakeholders and FOA wanted to get the cost of certification reduced for its members. “One way to do that is by training smallholders on ICS,” says Premila Kumar, CDE's antenna for the Pacific region. “Compared to the non-organic market, the organic market is small and has stringent demands relating to quality, packaging and certification. For the exporter, the implication is rigorous. “In developing countries, where many farmers are poor and cultivate small plots of land, inspection and certification is very expensive. “Most therefore practice group certification based on ICS. Group certification is possible only when there are sufficiently large numbers of farmers growing the same crop by the same methods and under similar conditions,” says Kumar. FOA had been looking at the workshop as a starting point to getting sufficient numbers where it would then put in place an ICS to consolidate the certification needs of aspiring organic farmers in the country. This message was sent by Moses Pretrick to the Island Food Community of Pohnpei mailing list. It might be relevant to other Pacific Islands as well. Another possible idea to further promote local food production and consumption is to physically expand our local food market facilities to provide more space for let's say 50 more farmers who are willing and able to sell their harvests. This sort of setting could probably help stimulate more production of local crops, including fruits and vegetables, and more competition with imported foods. We walk into a super market this week the shelves are full of imported vegetables and fruits; and after a week or so the shelves are completely empty. It is therefore clear that we need to sustain our local supply of fruits, vegetables and root crops to meet local and export demand for these healthy foods. Since our campaign to grow and eat more local food consumption has been gaining wider recognition for health, cultural, economic and other import reasons, government could probably spear-head a small pilot project to see if such idea would in fact work well here in Pohnpei. It seemed to work pretty well in some South Pacific island countries that consumed more local foods than we are. Crops Division of the Ministry of Agriculture and Fisheries in Samoa has just recruited a graduate from USP, Alafua, Kitiona Tugaga as its PGR Officer. The long term objective is to fully equip the Crops Division with graduates who will ensure the delivery of excellent science that will underpin the agricultural development of the future. We recognize the value of PGR in food security and the livelihood of our families and is envisaging a continual strengthening of this area as we move forward. As well, a second graduate has been assigned to our Tissue Culture Laboratory, Ataataotaulelei Meleisea to help move the research aspect of this work. Ata is now working with Sanitea Tulifau and very closely with Anthony Palupe of the USP Biotechnology section to move the tissue culture work forward. As a manager of a science organization, I am building towards a strong, scientific based Crops Division that will be able to deliver the research and development work demanded by the various agricultural and horticultural industries in Samoa. We also recruited two other graduates, Luai'ufi Aiono to move in the postharvest area and Tommy Tuumaialii to work in the seed production area. I can honestly say that it is exciting times for us and we are determined to build a strong Crops Division to build a strong horticultural and agricultural industry in Samoa. HONIARA, Solomon Islands (Solomon Star, Jan. 31) - Residents of Burns Creek in Solomon Islands Guadalcanal feared the continuing bad weather could destroy all their gardens along the Lungga River. John Seti Iromea, a spokesman for the residents, said most of their gardens were destroyed already as a result of the bad weather over the weekend and feared that continued bad weather would wash away the rest. "At the moment most of our food is gone and our fear is it will all go if the weather remains as it is," Iromea said. The Weather Office has indicated that the bad weather would continue for at least the next two days. Iromea said unlike most Honiara residents, Burns Creek residents rely on their gardens for survival. "We sell produce from our gardens then use the money to buy food. That’s how we survive," he said. Iromea said the destruction of the gardens would mean the loss of income and end a means of survival for them. He asked the Disaster Management Office to send officers to assess the damage caused by the flood.